There are a number of teachers who offer private yoga sessions here at Balance Yoga. All of them are experienced teachers who will be able to help you meet your specific goals. 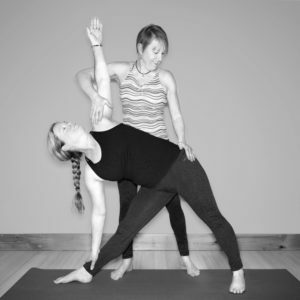 Some people are hesitant to go to a group class and want to start their yoga practice with a private class. Others have a specific physical or emotional issue that they want to focus on. Either way, a personal one-on-one session might be just the thing you need. If you have a group of friends, coworkers etc who are interested in booking a private class with one of our instructors at a time that works well for you, give us a call. We have had a lot of fun teaching to book clubs, runners groups, ski buddies who were lacking snow, 40th birthday parties etc. You can request a specific teacher or let us find the one we think would meet your needs best. Lynn Clauer also offers private Gong baths and Tibetan Bowl sessions for individuals and groups. These are incredibly relaxing and don’t require any yoga experience. Learn more about sound therapy.